Check out our new Bike Delivery promo video - we are trying to demonstrate our Philly street cred. We've decided to make a CAD life pass instead of making new ones each month. 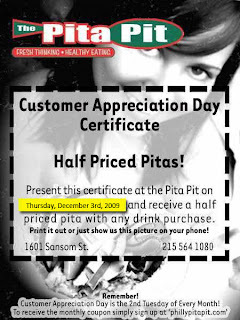 From now on, simply use this pass every month and you can rest assure that you'll enjoy a fresh half priced pita. The only thing we ask from you is to let your friends know and send it their way. As always, you can make your takeout orders online and pick them up instead of waiting on line. 50% off pitas when you order delivery! Despite the Snowicane touching down on Philadelphia today, we want to brighten up your day and keep some dough in your wallets. 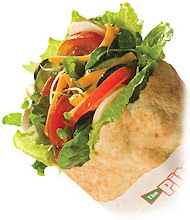 Today only, take 50% off all Pitas when you order on over our webpage. No phone orders PLEASE! Please make sure that you mention this special when placing the order or we won't be able to deduct the price. The Holiday Season is over, but our wish for peace and goodwill for all is not. Haiti desperately needs our help to get aid and support to the people affected by the terrible earthquake. Come into the Pita Pit this Wednesday, January 27th, get a pita, and $1.00 will be donated to The Red Cross to help with disaster relief in Haiti. If you get a "I Pita da Fool" t-shirt, $5.00 will be donated. We'll also have donation boxes out, so come in and let your cents help make a difference with The Red Cross. Orders you make online will automatically donate the money. Being a Sustainable Restaurant doesn't just apply to our immediate environment - it means helping the world. Come do your part and have a great, healthy meal, too. 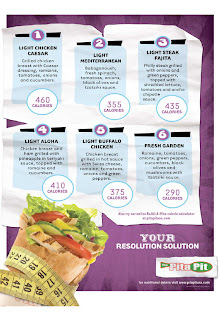 Check out our new light and healthy pitas for the New Year. With pitas like these... who needs anything else? BRR! We haven't been this cold in a long time! To help warm your souls and your stomachs this holiday season, we're chopping the price on all our delicious, freshly-made soups. All week, enjoy half priced soups with any instore or delivery pita purchase. We'll be changing our soups daily, and true to Pita Pit form, we'll always offer one veggie option, as well as something to please the carnivores. Today's sumptuous choices are, Potato Chowder and Chicken Tortilla. The only problem you'll come across with this deal is which soup to choose. You might want to consider picking up one of our hilarious signature 'I Pita 'da Fool' t-shirts when you order your soup. All t-shirts are reduced to $5.00 with any delivery order. Should you decide to brave the weather and make it down to the Pit, please bring with you a toy for a child in need. With Christmas fast-approaching, we're beginning to wrap up our Toys for Tots drive. Pick up a small, unwrapped gift and drop it at the Pita Pit today, and we'll make sure it gets to a child who needs some cheer this Christmas. Also still on is the buy $25 in gift cards get a $5 card for free. Pitas make messy stocking stuffers, but gift cards are juuust right. First Thursday CAD was off to a great start last month and we are excited to keep it going. 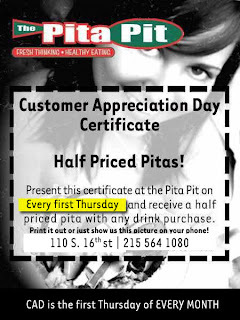 Here is the coupon for half priced pitas with the purchase of a drink. Remember, you can always order takeout online and automatically apply the half priced pita discount. A healthy fun and sustainable cafe in the heart of Center City Philadelphia. We specialize in custom made vegetarian friendly pitas. Would you like to see a vegetarian buffalo chicken option at the Pita Pit? 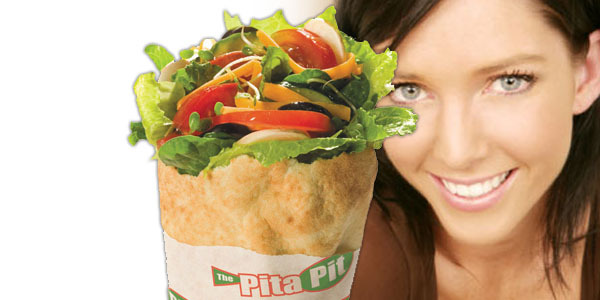 What would you like to see at the Pita Pit?